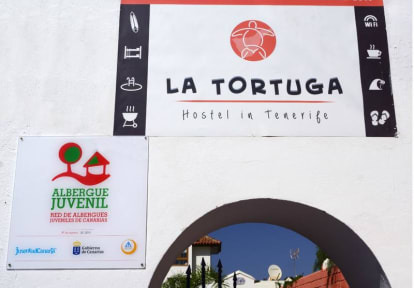 La Tortuga Hostel i Tenerife, Spanien: Reservér nu! 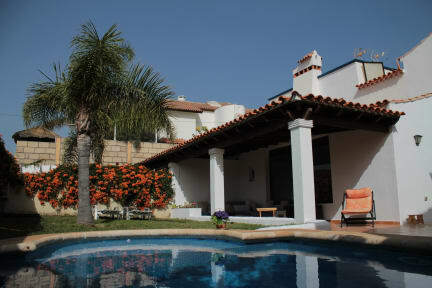 La Tortuga Hostel opened in 2015 and is in a prime location not far from El Duque beach (which boasts some of the best sunsets of the whole island) and close to the pretty village of La Caleta and Playa de Los Hippies. The famous tourist areas of Tenerife, Las Americas and Costa Adeje, are easily accessible by bus, bike or even walking. There is a large Hiperdino supermarket just around the corner and there are plenty of bars and restaurants nearby if you wish to go out in the evening. If you want to buy some typical product or some souvenir, the market of Costa Adeje is 3 minutes walk from the hostel and runs every Thursday and Saturday. We are a legal hostel, proudly part of Hostelling International and Red Canarias de Albergues de Juventud. We offer shared and private accommodation, which includes an “all you can eat” generous and varied breakfast. Our peaceful outdoor space has a garden with sun loungers, a small pool, a lovely covered terrace and a bbq area which hosts our famous Wednesday barbecue nights. Sports enthusiasts will appreciate the excursions offered – surfing, snorkelling, diving, paragliding, canyoning, climbing, hiking, whale watching- and nightlife lovers will welcome the bars, restaurants and nightclubs, all within walking distance. Reception time is from 9 am to midnight. If you are arriving at La Tortuga Hostel out of reception's time, please get in contact with us as we need to get organized. We recommend that you use our pickup service if your flight is arriving late at night: our reception is open from 9 a.m. until midnight. If you check in after midnight and don’t use our service, please be aware that a €7/hour surcharge will apply to cover the overtime payment of our receptionist. If you use our pickup service, there will be no extra charge regardless of your arrival time.